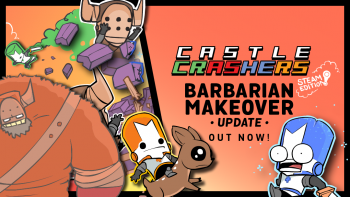 The formerly Xbox One exclusive "remastered" edition of Castle Crashers has come to the PC as a free update. You may recall back in September The Behemoth announced that Castle Crashers was getting the HD remaster treatment for Xbox One, with the added bonus that anyone who bought the original game on Xbox 360 would get it for free. Castle Crashers Remastered was thus an Xbox One exclusive, until today when a sneaky update to the Steam PC version of the game added all of the Remastered features absolutely free of charge. Back Off Barbarian will replace the All You Can Quaff mini-game, and the new Ultra mode is intended for use on high spec gaming systems and requires a 64-bit OS. It's turned off by default, so those of you wit beefier systems may want to go into the game's settings and turn it on. It's nice to see the Behemoth add all the new content as a free update for its loyal PC fanbase! The update is live now, and should automatically download when you next boot up Steam. As for you Sony gamers, there is still no word on whether or not Castle Crashers Remastered will make it onto the PS4.